Your contact person at the Kernboodschap, creative communication agency, is Bert Bras, a passionate communication specialist. The client sees the diversity of knowledge and expertise through an optimal result in creativity and effectiveness. 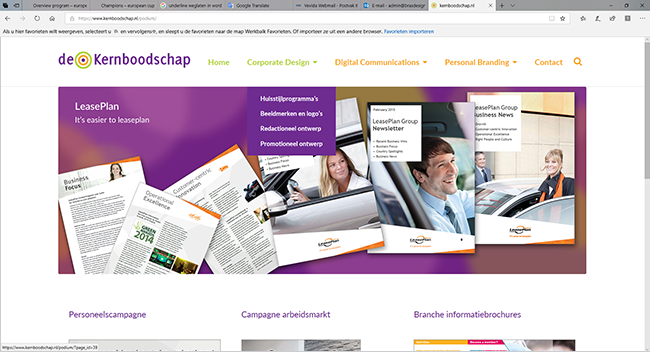 De Kernboodschap has developed its expertise at the cutting edge of marketing, design and new communication technology. De Kernboodschap has extensive experience in editorial designs (KPMG Magazines, sponsored magazines and printed newsletters), internet (electronic newsletters, government productcatalog Overheid.nl, intranet CAT/CART group ABN-Amro, community attendance guide IJburg, measures catalog for the Traffic and Transport Consultancy Department, Rijkswaterstaat, campaign site Vote CDA (elections 2002), Vote VVD (elections 2006), Markrutte.nl, JPBalkenende.nl, personnel and campaign campaigns (eg for Philips, SAP, MAN truck & bus bv, LeasePlan, SNS REAAL, SNS Bank, Volksbank), corporate identity programs (Boertiengroep, Grontmij, Amsterdam Population Register), Direct Mail (Adobe Software, OLM Verzekeringen), packaging (own brand Vroom & Dreesmann), brochures, advertisements and leaflets (for the most diverse companies).